The complaint has been lodged with the Vidhana Soudha police station under various sections, the state BJP said. A complaint has been filed against Karnataka Chief Minister HD Kumaraswamy alleging that the audio clip released about state BJP Chief BS Yeddyurappa's alleged bid to destabilise the coalition government was a "fabricated,created and truncated" one, the party said on Sunday. After coming to know of the "plot" hatched by HD Kumaraswamy and his associates to "tarnish" the reputation of BS Yeddyurappa and BJP, MB Maramkal (Yeddyurappa's associate) filed the criminal complaint, it said. "We hope that the investigating agency would investigate into the matter and press criminal charges against Kumaraswamy and his associates and bring them to justice," it said in a statement. Facing turmoil in the ruling coalition that has cast a shadow over the stability of his government, HD Kumaraswamy had on Friday released the audio clip in which Mr Yeddyurappa is allegedly trying to lure JDS MLA Naganagouda through his son Sharana Gouda. BS Yeddyurappa, who is at the vortex of the row over his alleged bid to poach the ruling coalition lawmakers for the past few weeks, was quick dismiss the clip as "fake" and a "concocted story". He had on Friday dismissed the claim by the Chief Minister that he had spoken in the audio about a ''Rs 50 crore'' offer to the assembly speaker. Noting that subsequent to the event on Friday when the Chief Minister along with others held a press conference and released the audio clip, the BJP said it was found that the clip was a "fabricated, created and truncated one." 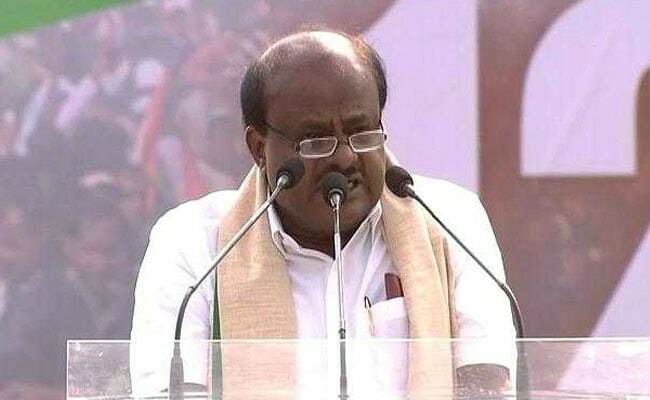 "The making of the audio CD and the release of the same to media houses was part of the conspiracy hatched by HD Kumaraswamy who is presently facing severe trust deficit from the legislators of his party as well as the coalition partner being the Congress," the BJP said. Accusing HD Kumaraswamy of indulging in "third grade" politics, BS Yeddyurappa on Sunday said he was ready for any inquiry into the audio clip. Pointing out that the Chief Minister has himself sent the lawmaker's son to him, the senior BJP leader said it was true that he spoke to Sharan Gouda, and charged HD Kumaraswamy with releasing only a part of the audio which he wanted. On the other hand, Karnataka state youth Congress has also petitioned Sadashivanagar police here to book a case against Yeddyurappa on grounds of "corruption and allurement" with money to poach MLAs from ruling side with an intention to topple the coalition government. Claiming that the audio tape of BS Yeddyurappa's conversation with Sharan Gouda that has been released is an evidence, Youth Congress Vice President (Malleshwaram) Ashwin Gowda in a statement said, a complaint has been filed at Sadashivanagar police station here recently,under whose jurisdiction BS Yeddyurappa's residence falls.